Snaking from Whitechapel Road, just around the corner from our hotel, north to Swanfield Street in Bethnal Green, Brick Lane is everything that makes East London such a vibrant, wonderful place. From street art and street food markets to vintage finds and cutting-edge designers with great Indian food and Sunday markets, you can easily spend a day discovering Brick Lanes delights. 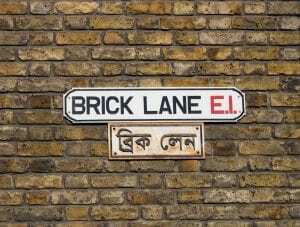 Situated in the heart of E1, Brick Lane offers an array of vintage shopping, jewellery, furniture, tea rooms and restaurants. Brick Lane is everything that makes East London such a vibrant, wonderful place.